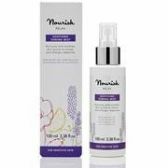 50ml Relax Softening Cleanser- Blend of calming Lavender and Foxberry Extract to soothe and calm skin. Recommended for sensitive skin. 98% Organic. 50ml Relax Soothing Toning Mist - Relax Toning Mist hydrates tissues for proper cell function. Recommended for sensitive skin and to help restore optimum skin tone. 97% Organic. 15ml Relax Calming Moisturiser - With Organic Lavender Oil, Borage and special Shea Butter Nilotica, this delicate and light cream is rich is Omega Oils and balancing ingredients to sooth sensitive skin. Lavender is well known for its powerful anti-inflammatory actives that help to alleviate the effects of damaging free radicals, to reduce physical stress and relax the spirit and soothe the skin. 97% Organic. 15ml Relax Hydrating Peptide Serum - This peptide serum is a calming, cooling and effective hydrator that leaves your skin visibly healthy and soothe. Recommended for sensitive skin to help retexture the skin tone revealing a richer and smooth look. 85% Organic. Aqua (water), Aloe barbadensis leaf juice powder*, Daucus carota sativa (carrot) root powder, Helianthus annuus (sunflower) seed oil*, Cetearyl alcohol , Cetearyl glucoside, Palmitoyltripept ide-5, Argania spinosa kernel oii, Glyceryl stearate, Lavandula angustifolia (lavender) oil*, Borago officinalis seed oil*, Vitellaria paradoxa (shea butter sp. nilotica)*, Bisabolol, Zingiber officinale (ginger) root extract*, Sodium levulinate, Levulinic acid, Glycerin, Cetearyl olivate, Sorbitan olivate, Potassium sorbate, Tocopherol, Coumarin, Geraniol, Limonene, Linalool. *Certified organic. Naturally present in essential oils. Aqua (water), Daucus carota sativa (carrot) root powder*, Helianthus annuus (sunflower) seed oil*, Glyceryl stearate, Glycerin, Sodium levulinate, Levulinic acid, Cetearyl glucoside, Cetearyl alcohol, Coco glucoside, Lavandula angustifolia (lavender) oil*, Potassium sorbate, Xanthan gum, Coumarin, Geraniol, Limonene, Linalool. *Certified organic. Naturally present in essential oils. Aqua, Daucus carota sativa (carrot) root powder*, Lavandula angustifolia (lavender) oil, Sodium levulinate, Levulinic acid, Glycerin, Potassium sorbate, Coco glucoside, Coumarin, Geraniol, Limonene, Linalool. *Certified organic. Naturally present in essential oils.